BAKERSFIELD, CA. 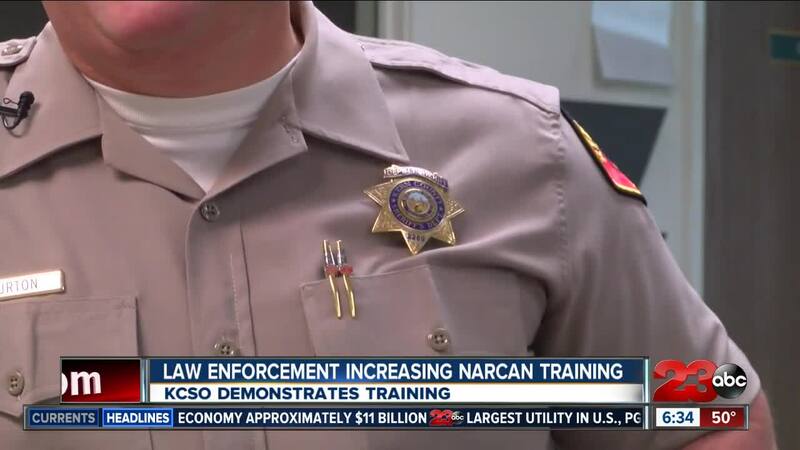 — Law enforcement agencies across California are increasing Narcan training for their officers and deputies since California's narcan grant program was approved in October. The grant supplies the county with 2,900 doses of naloxone, the drug found in Narcan. The drug is known as the reversal drug and it helps stop and revive patients who are experiencing an opioid overdose. For a while, Narcan was only distributed by medical professionals. But, in 2015 the FDA released a nasal spray version of the drug, which allowed easier transportation. Kern County Sherriff's Office has been training for the program for three years and they've saved seven lives because of it. According to reserve deputy and paramedic, Brent Burton, it's important for law enforcement to be trained to use Narcan in the event that they get there before an ambulance. "We're saving numerous lives throughout California now with our deputies," said Burton. Narcan is given when a patient's respiratory rate is less than eight. It blocks the opioid from continuing to overwhelm the brain and it helps the patient breathe again. Today, all 309 deputies assigned an AED kit carry the drug. But, the decision whether law enforcement should or shouldn't carry the drug is different in every agency. "Here within the metropolitan area, we're either simultaneously or on top of another with responding and arriving to calls," said Casey Snow, Bakersfield Fire Department. "We work together with BPD as a team. They handle the law enforcement and we handle the medical."